While the weather remains unsettled to close the week, your attention may be drawn to a pair of cold fronts that will bring strikingly colder temperatures. The first freeze of the season is in the realm of possibility. Today and Tonight: Cloud cover will be steadfast on Thursday with periodic showers. As winds turn northerly, highs will stay in the mid 70s. Rain and storms should increase overnight as a cold front approaches and thermometers will be steady in the mid to upper 60s. Up Next: As the cold front chugs southward on Friday, showers and thunderstorms will remain possible while temperatures tumble. An overall weird weather day is expected with a high in the 60s prior to dawn followed by late afternoon temperatures down into the 50s. Thermometers will continue into the 40s by Saturday morning. One dry afternoon is ahead followed another period of unsettled weather Sunday into Monday. As temperatures fail to recover much, a chilly rain is expected. A much stronger cold front will blast through by the middle of next week with forecast model guidance suggesting lows in the low to mid 30s and highs in the low 50s. The Tropics: As we continue deeper into the final month of hurricane season, the Atlantic Basin is quiet. No tropical development is expected over the next 5 days. 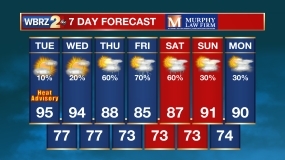 A cold front stalled near the coast will allow for slightly cooler temperatures on Thursday with scattered showers continuing—especially closer to the boundary. By Friday, an upper level longwave trough will amplify, dig into the Southeast U.S. and push a strong cold front through the area into the Gulf of Mexico. Rain and a few thunderstorms are expected with this front and the staunch northerly wind shift will result in morning high temperatures and late evening low temperatures on Friday. The frontal passage will briefly end rain chances and usher in much cooler air Friday night. This weekend will likely have highs in the upper 50s and lows in the mid 40s. Forecast models continue to be aggressive in developing an area of low pressure over the baroclinic region east of the Texas coast. From there, an eastward track along the old cold front will lead to a swath of precipitation stretching northward into the central Gulf Coast. There is still some uncertainty as to the northern extent of the precipitation but guidance has been consistent in showing a dreary, chilly period Sunday into Monday. Forecast models are likely not handling temperatures well and a much smaller diurnal temperature range will occur Sunday and Monday due to the clouds and precipitation. From the upper 50s on Sunday, there should not be much more cooling than the low 50s overnight. Should a warm front develop with the Gulf low, it is likely to stay well south of the area and therefore Monday highs will stay close to 60 degrees. As a spoke of the longwave trough digs even deeper on Tuesday, yet another cold front is poised to punch through the area, ending rain and sending lows into the 30s for the first time this fall season. GFS and ECMWF ensembles have some Baton Rouge area readings near 34/35 degrees on Wednesday and Thursday mornings. 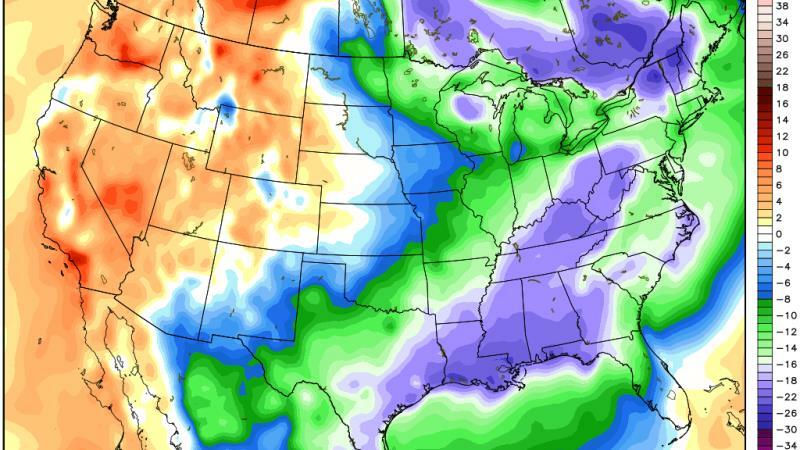 Climatologically, this is not far from normal for the first “cold blast” of the season.